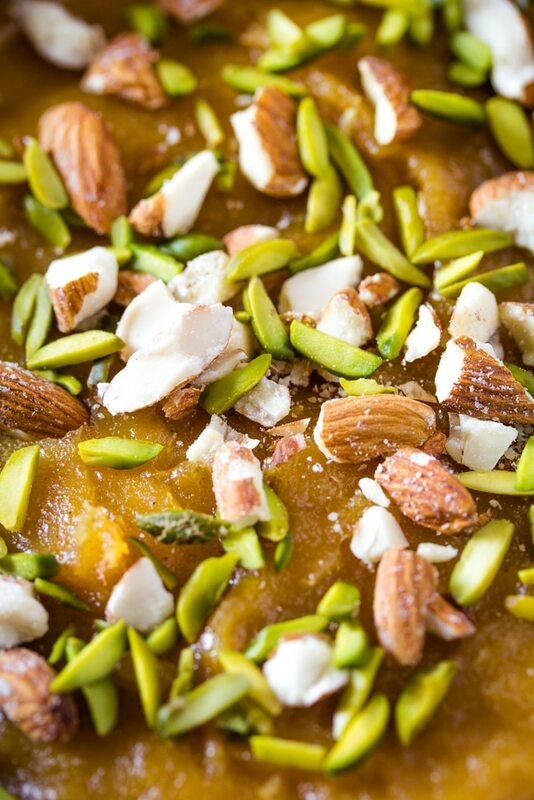 Besan Ka Halwa is a quick and easy Pakistani dessert that is super delicious…it’s made from gram flour, sugar, butter or ghee and cardamom powder. 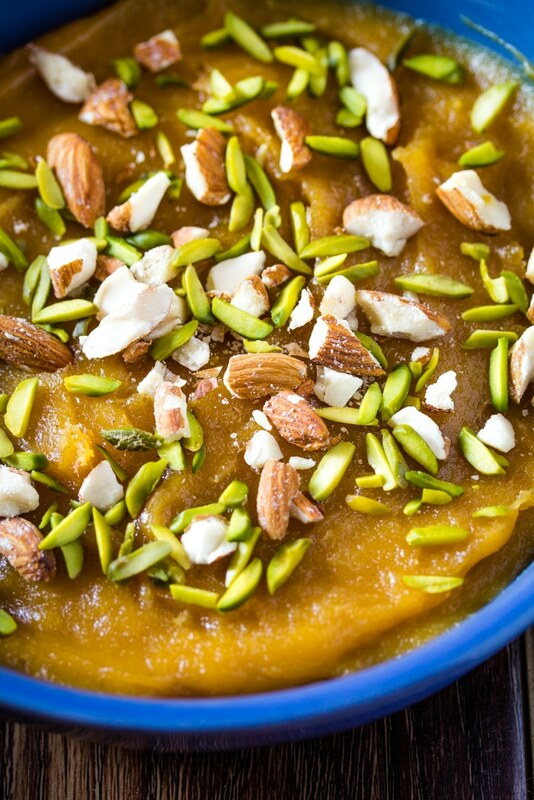 Today I’m sharing with you, one of the first Pakistani desserts I learnt to make…and given that I barely knew how to cook then, this is proof enough that this is a super easy dessert. After I got married, I would often spend time on Pinterest looking up easy desserts because I’ve got a major sweet tooth. I would make brownies and cookies and cakes. But after living away from Pakistan for awhile, I started missing Pakistani food and desserts like Suji ka Halwa and Shahi Tukda. The thing was though, I wasn’t any good at making Pakistani desserts so I wanted to go super easy on myself. And so the first halwa I ever made was this besan ka halwa. And guess what? It was SO easy that I didn’t fail at the first attempt! 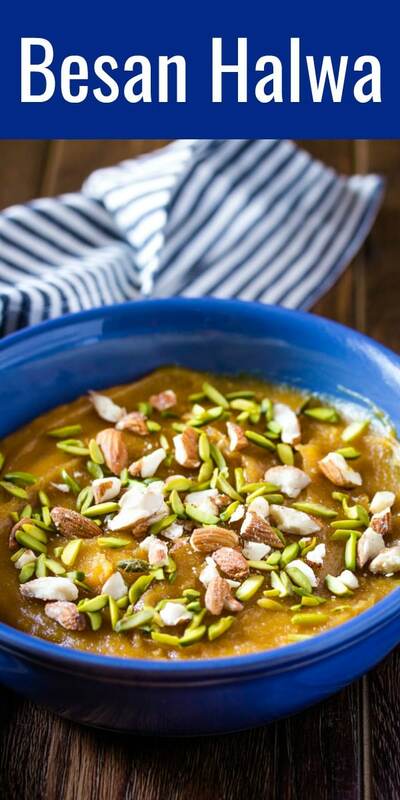 Not to mention, this halwa is a very pantry friendly recipe. I’m sure most of us desis always have gram flour (besan), ghee or butter and cardamom at home. 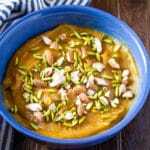 But if you’re not familiar with besan and somehow came across this recipe, let me tell you what besan is. Besan is gram flour, which is basically chickpea flour. Chickpea flour is used quite a lot in Pakistani and Indian recipes…we make pakoray with it, we make Kadhi with it and we also make besan ka halwa…yum! Also besan ke laddoooo…yum! Such a versatile flour, right? 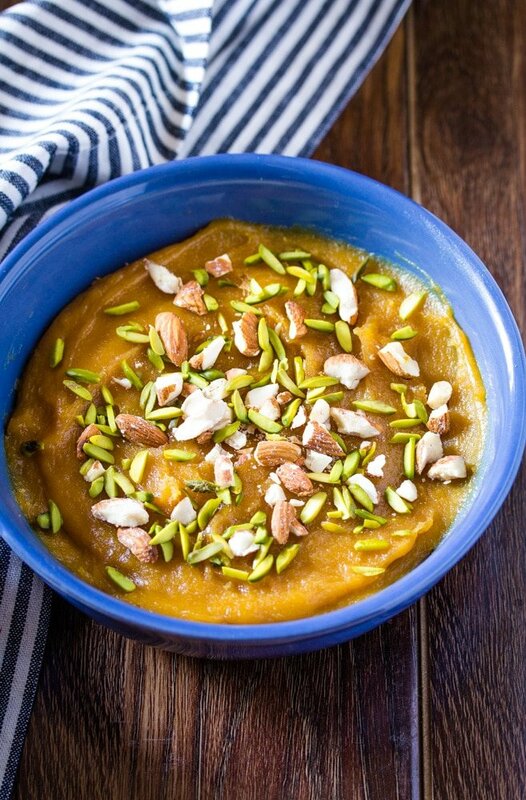 So How Do You Make Besan Ka Halwa? Start by melting ghee or butter in a wok. I usually have butter at home, so I used butter. 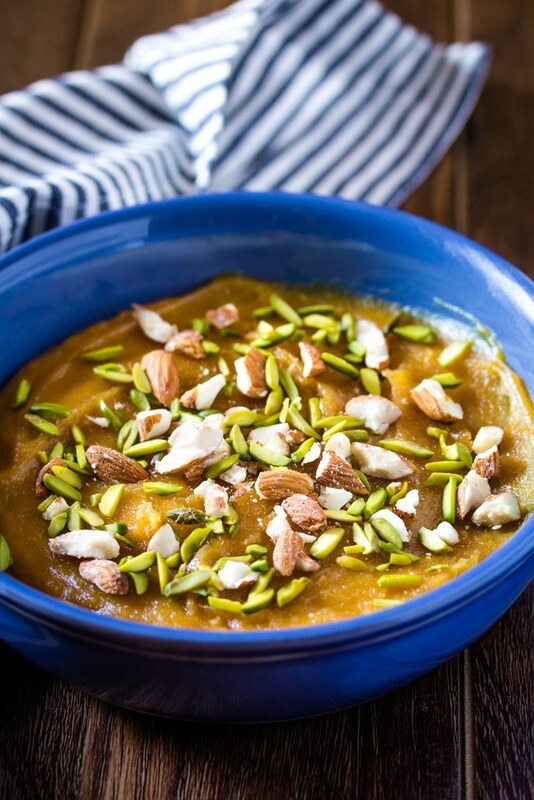 But for a really authentic flavor, ghee is best for this besan ka halwa. Once the ghee or butter has melted, add your gram flour and cook it on medium high heat until it changes colour and releases a nutty aroma. Next add the milk, making sure to stir continuously so that no lumps form. Now it’s time to add the sugar and cardamom powder. You can even use whole cardamom pods but just crush them up a little bit before adding them to the halwa. Keep cooking on medium heat, until the halwa stops sticking to the sides of wok and sort of forms into a cohesive ball. Transfer to a serving dish and top with nuts such as almonds and pistachios. And that’s about it. 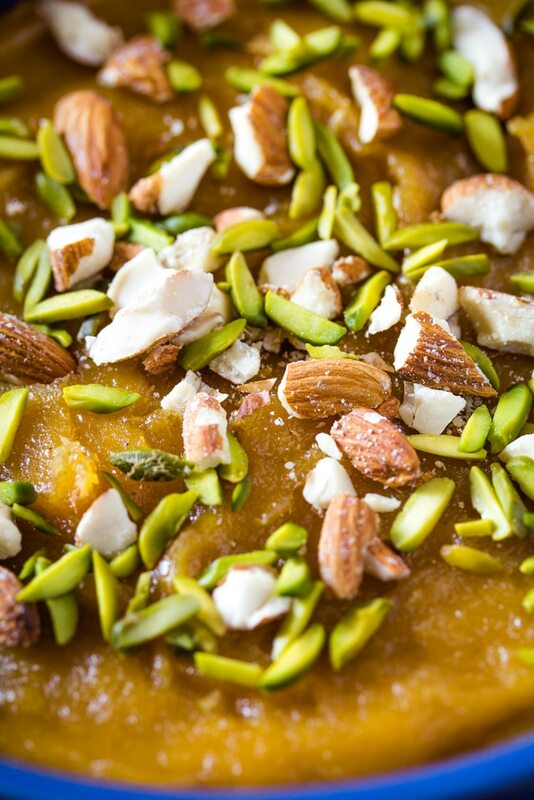 Your delicious besan ka halwa is ready!! It’s so good, that it would be even great served to sudden guests. Or when you’re craving for dessert but don’t want to put in too much effort. Which is like always me. Lol. In a large heavy bottomed pan, heat the butter or ghee. Add the besan, and fry until the besan starts turning golden brown and releases a nutty aroma. Add the milk slowly, while continuously stirring the besan so that no lumps form. Now add the sugar and cardamom powder, and stir to combine. Keep cooking on medium heat, until the halwa starts to form a ball and is no longer sticking to the sides of the pot. Transfer to a serving dish, and top with the nuts.